Outdoor Courses for Scrambling, Climbing, Kayaking & Mountain Activities: A busy few days inbetween our visit to Spain and Iain's departure to The Alps. July 2nd - 5th 2015. A busy few days inbetween our visit to Spain and Iain's departure to The Alps. July 2nd - 5th 2015. We arrived back from a warm & relaxing week in Northern Spain (Galicia) on July 1st. Iain was back at work the following afternoon at Hause Gill in Borrowdale with Nucleargraduates - one of our regular corporate clients, for another Lake District Ghyll Scrambling Session. Nucleargraduates have been using our services to provide these sessions since 2011 and have been very satisfied with the results in so much that with this client group, these sessions are more than just about having fun! As well as that, these sessions are used to impell these successful recruits to the organisation into working with each other and getting to know each other - something that is imperative to the success of their two year apprentice-ships within the organisation. As usual, this group enjoyed a great and productive session in the ghyll with Iain and were well equipped to remain warm and protected during their session - something that we take very seriously! Two days later, Iain was out running another Ghyll Scrambling Session in The Lake District for Ian, Jake, Charmaine, Charlene and Stacey who were visiting the area for the weekend to celebrate one of the groups birthday. Iain took them to our nearest Ghyll Scrambling haunt reserved only for small groups as it involves a short journey by Land Rover and our vintage vehicle only has six seats! We were short on time as this group had to be elsewhere within a few hours, but as can be seen in this photo, they absolutely loved Ghyll Scrambling and it is quite likely that they will return again to finish off the rest of this ghyll - we do hope so anyway! At the same time as Iain was out with a group of five, one of our associates was working with a group of three also Ghyll Scrambling in The Lake District at one of the areas best Ghyll Scrambling venues - Stickle Ghyll. Ioan, Mark & Dyl - all old university chums enjoyed a great session here with Chris who guided them all the way up the ghyll where they were able to scramble upstream - climbing up waterfalls and swimming through pools. For both groups today, the weather was warm, so it was ideal for thoroughly fun sessions enjoying a soaking in a mountain stream. Ghyll Scrambling is great exhilarating fun best done in the summer months when it is warmest. We provide wetsuits, cagoules, buoyancy aids helmets, harnesses and walking boots as part of your fee of £45 per person to keep you warm and protected. A session will last up to four hours and the bigger your group size the less it costs you! For people looking for something a bit more challenging, our Church Beck Canyoning Sessions are ideal and if you want a full day of wet Adrenalin packed fun then our Esk Gorge Sessions at only £75 per person are unbeatable value and fun! The next day, we were once again double booked by groups. 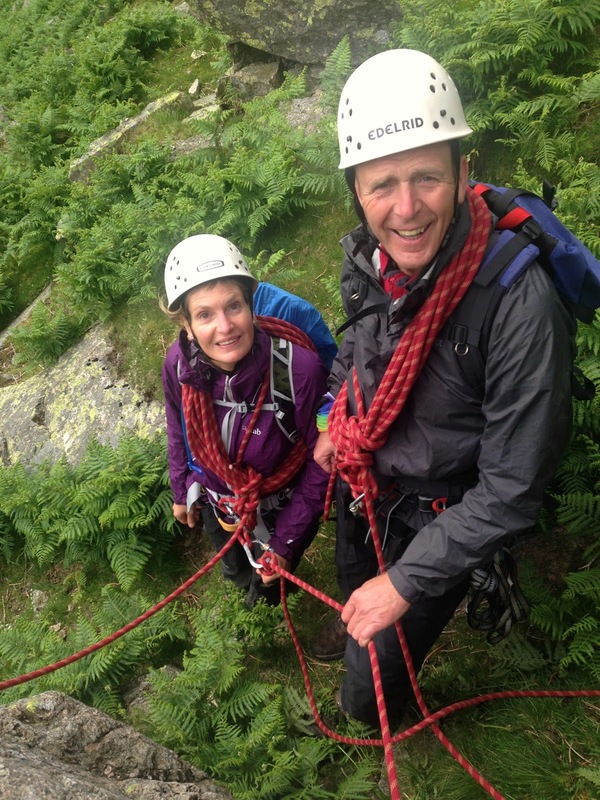 Kate Bowman and here husband Dave spent the day in the Stickle Ghyll area of Langdale working with Mountaineering Instructor Simon Brocklebank - working on our behalf. Simon's brief was to teach Kate & Dave the basics of scrambling ropework so that the pair could learn the skills to go off scrambling for themselves. Firstly the pair were "guided" by Simon up part of Stickle Ghyll so that they could see what the skills involved and then they went on to Tarn Crag to look at scrambling belays. Finally, the pair were coached by Chris as they made their way up a grade II scrambling route on Tarn Crag. All good coaching and it certainly looked as though the pair enjoyed themselves judging by the photo! At the same time Iain was also working in the same area running a Guided Scrambling Day in The Lake District for Ioan, Mark & Dyl who had been Ghyll Scrambling in Stickle Ghyll the previous day with Chris. All three of these lads were big strapping rugby players and they wanted a good day out, Iain thought he was going to have his work cut out! We started off by ascending the grade II route - Piked How, from the the Langdale valley floor and eventually reached the top of this at around midday. As on the previous occasion that Iain guided on this route, he linked it with another scramble leading on to the top of Harrison Stickle and we arrived there about 2pm. There was still time to do another route, so we descended Jack's Rake which is one of The Lake Districts classic scrambling routes. The photo shows the lads at the bottom of Jack's Rake after a very energetic & exhilarating day out on some of the areas best scrambling routes. Ioan, Mark & Dyl thoroughly enjoyed their Guided Scrambling Day in The Lake District with Iain. Next time, we are talking about taking them to the Esk Gorge! Finally, whilst Iain has been in The Alps, other instructors have been working on our behalf with other groups. We have had a Hen Party on a half day Lake District Ghyll Scrambling Session in Stickle Ghyll on July 11th and more recently, we had another Mountaineering Instructor running a Rock Climbing Skills Training Course in The Lake District for us. Unfortunately, neither instructors managed to capture the shots of these groups working which we know you all love. So our last photo from this post sees a photo of a previous Hen Party having great fun with us at Stoneycroft Gill. We are now up to date with our Blog posts; and if you like the look of any of the Activities or Skills Training Courses on offer here - then contact us to make your enquiry or to book a session. We have plenty of availability throughout August for those of you here with children over the Summer Holidays - most of it now being weekdays. But do get in touch and we will be happy to provide a great Outdoor Activity Session or skills training Course for you!